This recipe I found in the recent edition of America's Test Kitchen called Best Summer Desserts, which came in full color this time. As you know, I don't bake that often, maybe 3-4 times a year for a very special occasions (bread and savory baking doesn't count). Also a high motivation is needed to put in in a baking mode. This time I had the occasion, all was needed was a motivation. That's where the magazine played it's role: I turned page by page until one photo struck me. 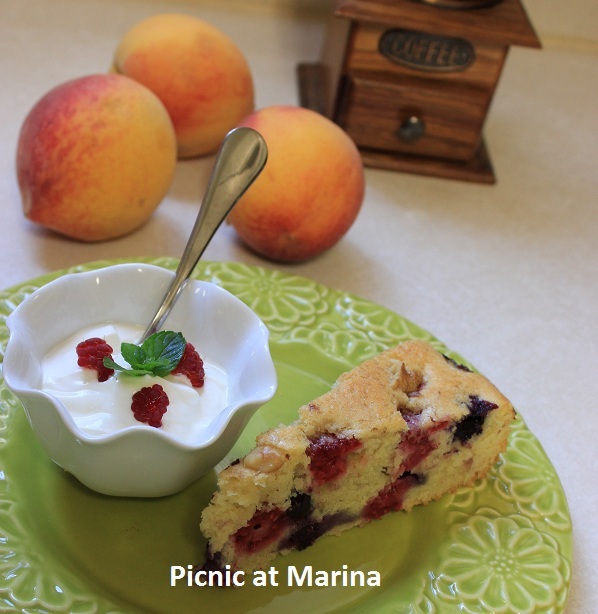 It momentarily brought me back to my grandmother's country home: table under the cherry tree was covered with white airy tablecloth, a bawl of fresh summer berries, a clay pitcher with fresh milk, and a summer berries cake. Fresh breeze from the river would swing through the play area with an inviting smell of cake would gather us, kids, around the table for a snack. I lingered over that page for some time before I continued reading. And then I went back to that photo, and idle in the moment before I put on an apron to carry on to baking. 1. Preheat oven to 350 F (175C). Oven rack is on the middle position. 3. In a stand mixer beat together butter and Agave nectar (or any other sweetener of your choice) until butter is pale and fluffy). 4. 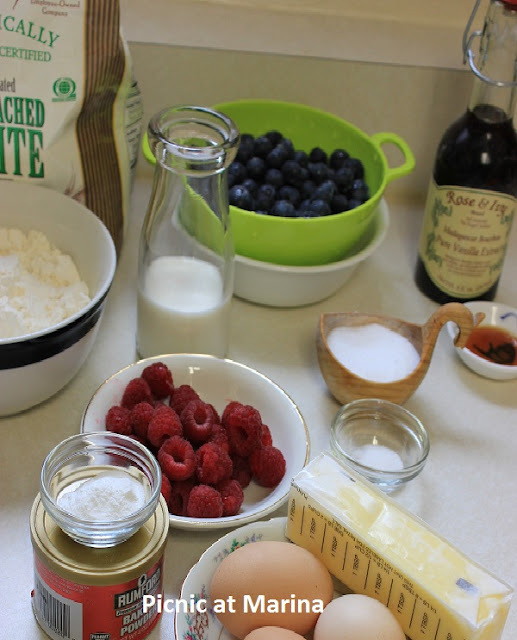 Add eggs and white, one at a time. Add vanilla and beat until well mixed. Scrape the bawl and a paddle, if needed. 5. Start adding flour in portions, alternating with milk. 6. Stop the mixer, and give batter a good stir to make sure all ingredients are mixed well. 7. Gently fold berried into the batter. 8. Transfer batter to a well greased 9 inch pan, even the top. 9. Bake 35-40 minutes, rotating pan in the oven half way through. Set a kitchen timer for 20 minutes for this task. When cake is done, toothpick, inserted in the middle of the cake, comes out clean. 10. 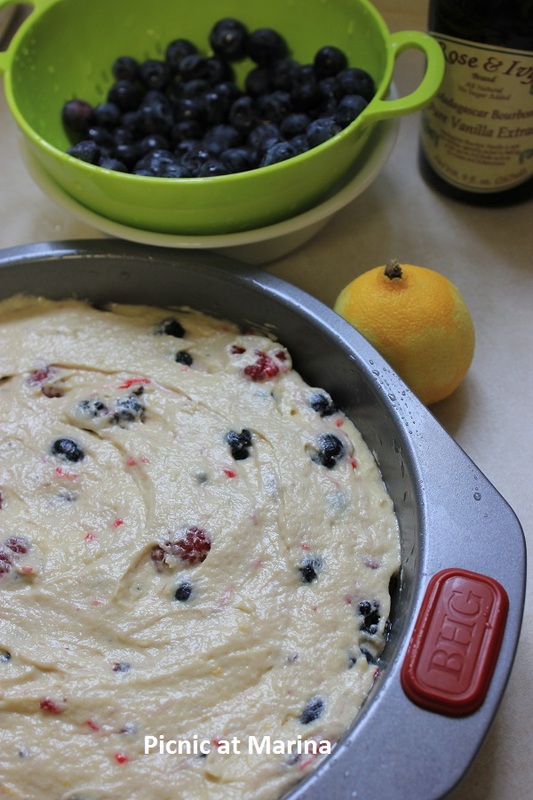 Cool cake in the pan for 30-60 minutes. Topping: whisk together sour cream and Agave nectar. Chill in the refrigerator before serving. Serve cake with a dollop of topping, sprinkled with a few dollops of lemon juice and lemon zest. To make it diabetic friendly cake for my father, I didn't use any sugar in this cake. I also reduced the amount of sweetener in half in both cake and topping. 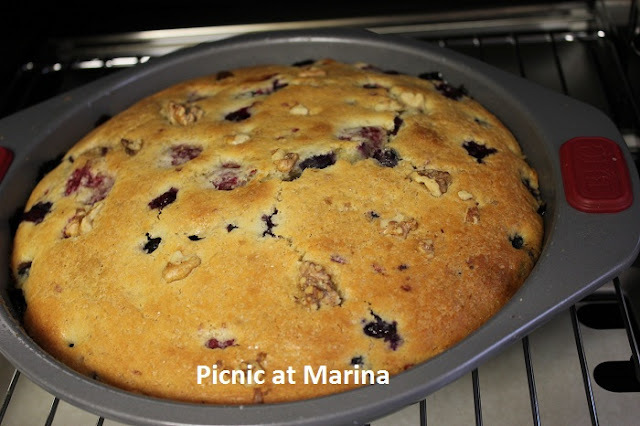 The cake tasted great with all the fresh berries flavor combination. The original recipe uses whipped heavy cream for topping. 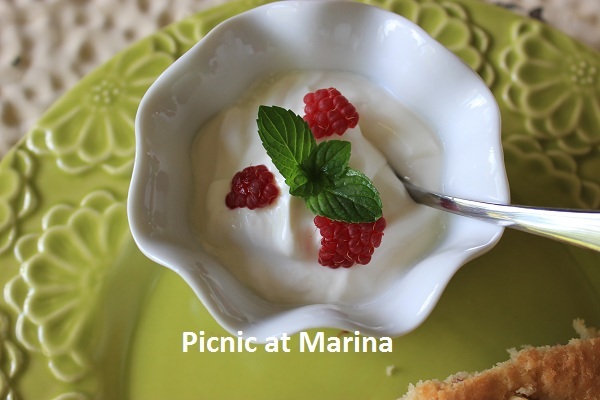 I made topping my grandmother's way, with chilled sour cream. When teenager had his first slice, he said that he had a feeling that he had something like it before, but doesn't remember me making it. I told him that when he was little, we spend a few summers at grandma's summer cottage, and he did enjoy eating that cake. He doesn't remember anything but the taste. a photo, a taste, a smell? Love the fruit colors in the sliced cake. I would prefer eating it with a scoop of ice cream though. Photos, taste, and smell trigger my memories! Your cake looks so good, and I loved reading about your memories of cake at grandma's house! I have that cookbook, and bookmarked this recipe. Glad you enjoyed it, I need to make it soon ;-) Thanks for sharing. Yes this is a very nice and easy berry cake :-). I am following you! I love this cake!!!! It looks sooo good! And with yogourt, yummy! One of my fave cakes..I love simplicity and the taste is always so satisfying. Great idea using sour cream! Marina-What an amazing find. I get that way too...sometimes the photo of a dessert or food just captures me, and I keep going back to it to decide to make it! 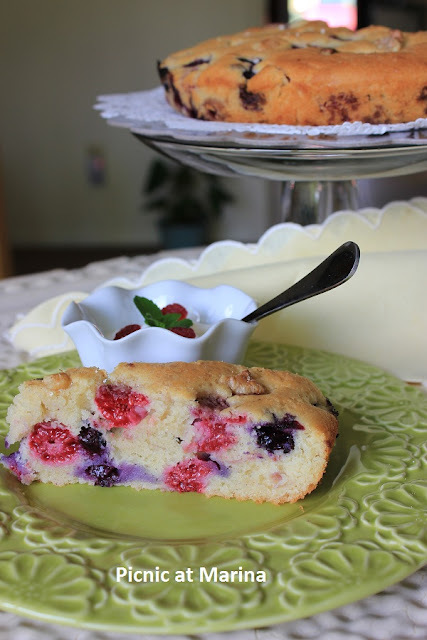 I love the pretty cake with the berries, and the sour cream topping is so perfect. Everything is lovely, the presentation, and especially the photos! I'm sooo pinning this on Pinterest! Thank you Elisabeth! I love sour cream toppings more that anything else. I think it's because I grew up with it. Thanks for your compliment on photos, I am truly touched. this looks wonderful!! hi i am a new follower! Thank you Lynn for leaving a comment and for following me. Nice looking cake! I haven't had a chilled sour cream topping for ages. Actually, it's one of those things I totally forgot about! And it has such great flavor, too. Thanks for the reminder. It's perfect time to make some plans for the future and it's time to be happy. I have read this post and if I could I wish to suggest you few interesting things or suggestions. Maybe you can write next articles referring to this article. I wish to read more things about it!